In 1996 I worked in Mexico for eight months and during my time there visited the famous village of San Cristobal de las Casas in Chiapas. One of my abiding memories of San Cristobal was of the women from the village who were selling artisanal products to tourists on cloths laid out on the floor in the square in front of the church. 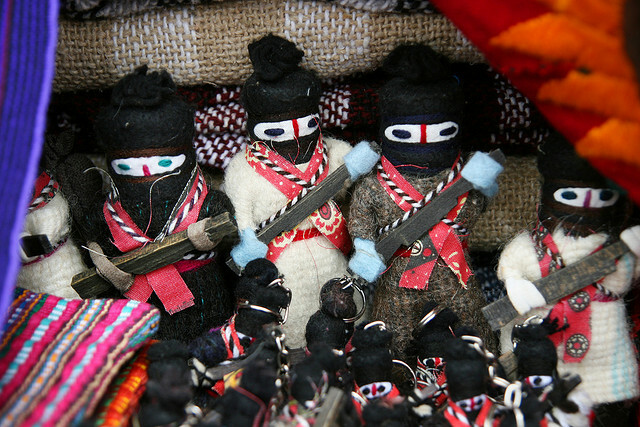 Whilst the sale of artisanal objects was commonplace in Mexican villages, in amongst the traditional traditionally dressed dolls I had been surprised to see dolls sporting cloth balaclavas and guns. The dolls were a homage to Subcomandante Marcos and the 1994 uprising of the Zapatista Army of National Liberation (EZLN) against the Mexican government and its signing of the NAFTA free trade agreement with the United States. Having not thought about these Mexican figures for many years, I was even more surprised, on visiting the V&A’s Disobedient Objects exhibition, to find one of the Mexican dolls of an EZLN leader on display as one of the collection’s examples of an activist object. At the end of 2013, I was involved, under the auspices of the ESRC Centre for Research on Socio-Cultural Change, in organising a collaborative workshop with one of the curators of Disobedient Objects in anticipation of the forthcoming exhibition. The aim of the workshop was to explore social science approaches to thinking about activist objects. During this workshop all of the participants had been asked to bring an activist object. Despite having bought one of the Subcomandante Marcos dolls during my time in Mexico, it did not occur to me that this might be an example of the kind of activist or disobedient object sought by the exhibition. Instead the object I brought was a document produced by climate activists in the UK. I had chosen to bring a document to the meeting because in my recent work on climate politics it had become increasingly apparent that much of the politics of climate change mitigation in cities in the UK is being enacted through the circulation of documents and reports. I had been fascinated to come across a report produced in the mode of direct action, that was intended to intervene directly in the documentary practices of policymakers by disrupting and exposing the shortcomings of a prior report into carbon reduction that the local authority in Manchester had commissioned from an environmental consultancy based in London. The activist document performed a critique of the bureaucratic language of the original report, enacting a mimicry of the original whilst transforming it through the deployment of more overtly politicised, alarmist and revolutionary language. Although a climate change report and a Mexican doll might seem but distant relatives, the success of the Disobedient Objects exhibition lay precisely in the way in which it revealed a kinship between such materially and culturally distinct objects. The freshness and liveliness that this exhibition managed to inject into the conventionally conservative space of the Victoria and Albert Museum, was largely achieved through the juxtaposition of an uncanny collection of objects that it brought into the same space. Whilst a catalogue of these items might on the face of it read somewhat like a Borgesian Chinese Encyclopaedia: mobile mausoleum, iPad app, drone, water bottle, indigestion tablet, robot, puppet, post-it note, banner – the openness of the curators to including such a range of objects is testament to their commitment to capturing the creativity, drive and ingenuity of activism through its manifold material practices. The display of activism through its objects allowed for the logic of activism rather than just the ideologies of particular political struggle, to come to the fore. Returning to the doll and the climate change activists document then, the exhibition has helped me see past their instrumental purpose or historical form to discern something of an activist logic that they both share. Like the document, the Subcomandante Marcos doll enacted a subtle twist on a recognised cultural form. Moreover, in light of the exhibition it struck me that the figure that the doll was depicting was also in many ways an activist object. Subcomandante Marcos himself was a nomme de guerre, a symbolic figurehead for the EZLN whose performative enactment of revolutionary leadership was meant to translate the struggles of a peasant community into a political register that would be recognised by their adversaries. By drawing attention to the role of objects of any kind – be they papier-mâché puppets or media images, rubber stamps or bicycle locks, dolls or figureheads of revolutionary movements – Disobedient Objects offers a unique perspective on the question of just what activism is, and how it brings about its political effects.